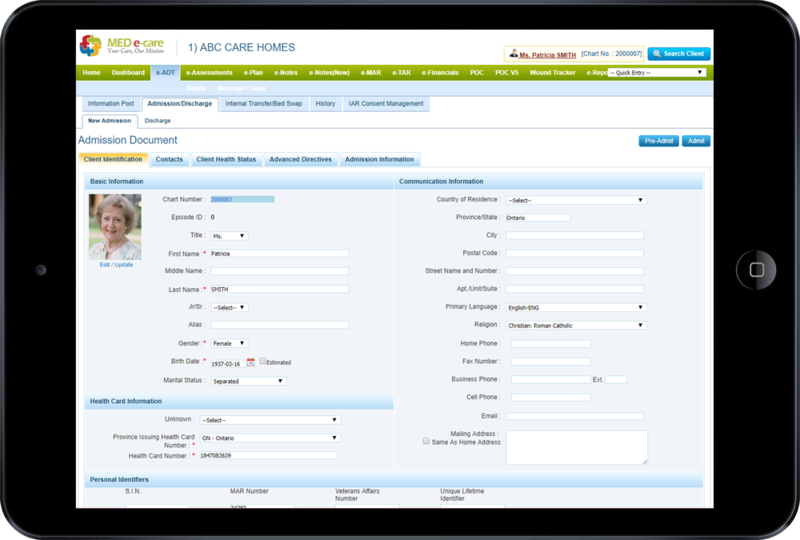 In ADT, staff are able to record a set of client information; track client location and status; maintain census period information for billing; centralize client information and share it with other MED e-care applications, both clinical and financial. Pre-admission and wait listing functionality allows staff to prepare for clients’ arrival in advance, including bed reserve and pre-admission assessments. Data flows from ADT to the RAI/MDS, including Diagnosis. Items in MDS/CCRS/CHA sections are automatically filled in, including name, gender, birth date, ethnicity, health care number, postal code, occupation, room number, and marital status. Face Sheets are prepared automatically using information entered in ADT. Province-specific and facility-specific formats are available. Mortician receipts can be printed separately or as a second page to the Face Sheet. Drop-down lists of possible entries are provided throughout ADT, along with search features, to assist in data entry. At the first contact with a prospective resident, you can collect and store information using the Pre-registration window. ADT maintains a wait-list of active prospects. Once the inquiry becomes an admission, the Pre-registration data can easily be transferred to Registration without any re-keying. Comprehensive information on each Resident is entered and always available from one main window. Contacts: personal and professional, such as; dentists, physicians, next of kin, etc. Payer: data entry fields specific to Medicare, Private Pay/other, and Insurance plans.